The Willamette Valley is known for its world-class wine, but as most tourists soon discover, the scenery boasts much more than grapevines draping the hills. Soaring evergreens frame the landscape with majestic mountain views on clear days, and, come fall, the mighty oak savannas give New England “leaf peepers” a run for their money. Loaded orchards, century-old barns and even the occasional olive grove are often surprising details worthy of attention — or Instagram — but, if you are driving, you might miss it. Proving that getting there is half the fun, here’s a list of six local companies elevating — sometimes literally — the journey to be on par with the destination. 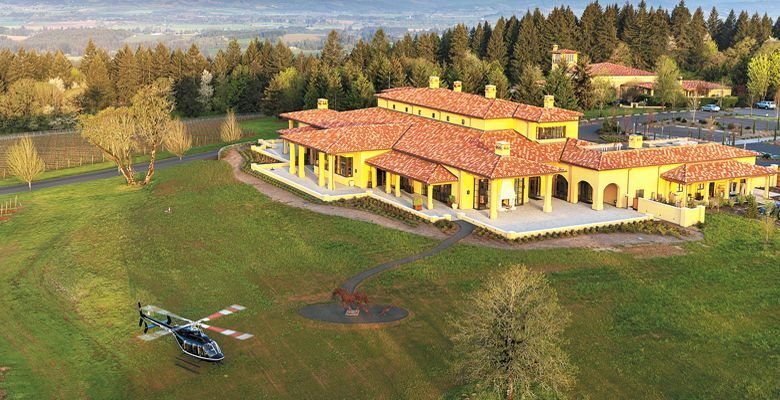 Currently, the only Willamette Valley winery offering non-stop flights from downtown Portland to the Valley, Domaine Serene Wine Lounge at Sentinel has partnered with Hillsboro Aviation to whisk passengers from their Alder Street location to its Dundee home. 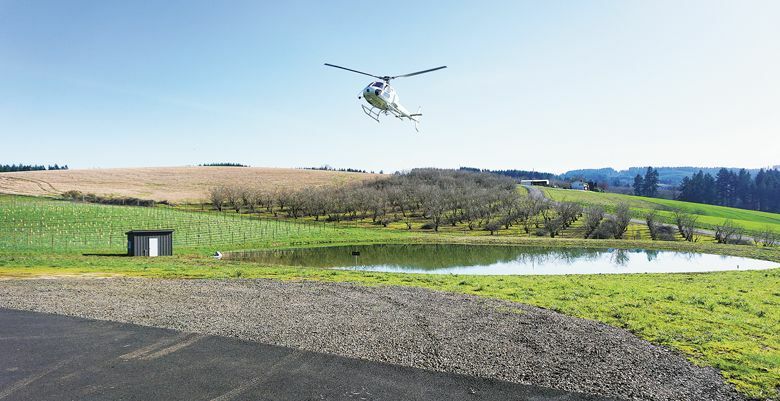 After flying above the city skyline, guests are treated to a bird’s eye view of all six Domaine Serene vineyards, including Jerusalem Hill and Evenstad Estate, before descending to Domaine Serene Estate and Winery Hill Vineyard. The fully customizable tour can begin from other locations, such as The Allison Inn & Spa, but those departing from downtown Portland begin their adventure with a drink at the Wine Lounge, followed by a short trip to the Chinatown heliport by private car. After landing at the estate, riders are greeted by a glass of rosé. Once inside, guests can partake in a number of culinary-driven tastings — like the 45th Parallel Experience — as well as private tours of their grand 30,000-square-foot Clubhouse. With Burgundian winery Château de la Crée woven into its tapestry, time spent at Domaine Serene feels like a world away. Offering helicopter tours from their downtown Portland venue is yet another thread that adds strength and perspective to their story. 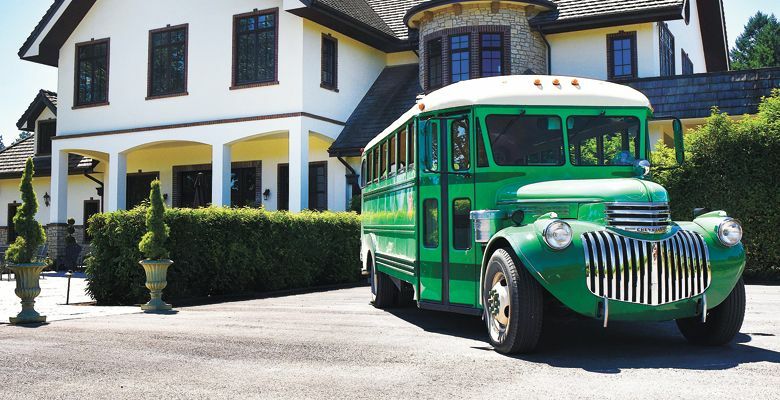 Pulling from three decades of experience as a film industry set decorator, Sean Kennedy purchased a decommissioned school bus and transformed the 1945 Chevy into a funky and spacious tour bus. To ensure maximum comfort, a set of 20 seats was repurposed from a shuttle bus and a surround-sound stereo system was installed. Paying tribute to a bygone era, Kennedy was careful to choose a vintage color scheme that carries from the exterior in. 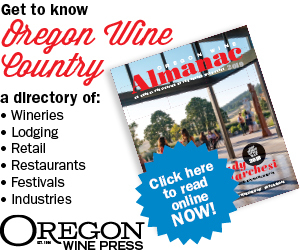 As “Gus the Bus” makes his way along the vine-framed back roads of the Willamette Valley, Kennedy shares wine tasting tips, geological information and AVA anecdotes with passengers. Depending on the interest of each group, he can delve deeply or just scratch the alluvial surface. Gus affords a higher perspective than a passenger vehicle and, surrounded by more than two dozen windows, it’s like an interactive Disneyland ride, drinking in all the beauty of wine country. Lunch at one of the wineries is on every itinerary; Kennedy offers a selection of wine-friendly snacks, and there is plenty of room onboard for wine purchases. Escorting intimate groups up to six, longtime Yamhill County resident Crystal Laridon serves up a large dose of fun on her wine country tours. 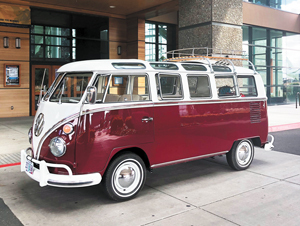 Being a passenger in her lovingly restored 1967 21-window deluxe Volkswagen bus evokes ’60s flashbacks — even if you didn’t live through the era or have forgotten them. Even if tourists can’t recall some of those fuzzier memories, they will not easily forget the van’s name: “Jimi” — I’m sure you can guess who inspired the moniker. Private tours are offered but possibly even more fun and apropos are Hippie Sip’s weekend group tours, May through October. For those who want to wander wine country but have no one to travel with — because your friends are busy washing their hair — the group tours present the perfect solution; new friends are always made and good times are definitely had. Laridon cautions that clients must be comfortable with attention because riding around in this retro gem causes quite a stir. Waving from the expansive Samba sunroof on a sunny day is the quintessential photo-op. Soaring above a profusion of patchwork-quilt vineyards, Tour DeVine by Heli aims to offer the highest end wine country experience available. The day begins with a glass of locally sourced bubbles along with fruit and baked goods from Red Hills Market. Two different helicopter styles guarantee a custom adventure and a storage box fitted to the outside of each aircraft can store up to 14 cases of wine. Tour DeVine can choose wineries for guests within each of the six AVAs they encompass or leave that to the clients to predetermine. As an all-inclusive tour, every Tour DeVine booking includes winery tasting fees, morning bites and a gourmet lunch. Typically savored at the second winery of the day, each Red Hills Market picnic is packed in a reusable burlap wine tote. Inside is a treasure trove of charcuterie, cheeses, nuts, sandwiches, sparkling water and the like. They even remember local chocolates for a sweet ending. Since its inception, Tour DeVine has finessed a comfortable balance of vineyard diversity, flight time and tasting time with every take-off. Extensive travel and first-hand experience in wine regions around the world was a natural byproduct of Roger Bingham’s successful career in hospitality. 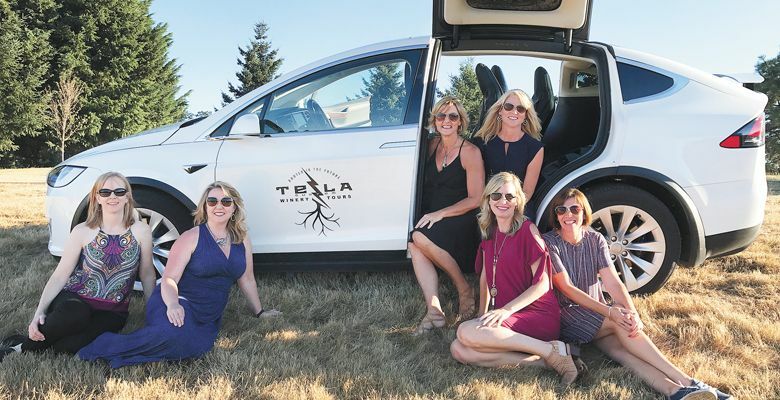 Looking for a unique touring concept where he could provide a top-tier encounter that would pique his own interest, he chose to invest in a Tesla — fitting for the sustainable nature of so many Willamette Valley wineries. Bingham has since added a 14-passenger Mercedes Sprinter van, a Volvo XC 90 SUV and a Mercedes sedan to his fleet, but his Tesla continues to be popularity. At Tesla Custom Winery Tours, “custom” is still the driving force but an in-vineyard lunch and non-alcoholic beverages are included in pricing as well as pick-up and drop-off in Portland, if necessary. With his luxury fleet, the drive is one of the hallmarks of a Tesla tour. Bingham maximizes each route to take into account bends in the road, diverse landscapes and architectural beauty. He imparts a deep dive of the local geology and aims for a winery selection from off-the-beaten-path to boutique to grande dames of the Valley. Looking for a way to accommodate a large group? 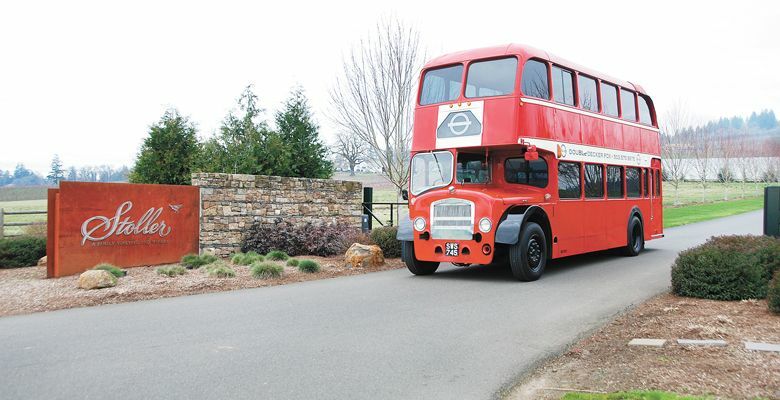 Look no further than a fully-restored 1959 double-decker bus imported from the U.K. This bright red beauty seats 30, features a built-in mini-fridge on each level, its own bar, live-edge wood details, LED lighting and limo-style seating. Aside from the European flavor it imparts, Double Decker PDX focuses on itinerary-building with an interactive Google map maintained by Carter. Once clients book the bus, Carter sends links with winery descriptions, cost per flight and other details. With this information, the company can offer guests as much or as little input as they desire in planning their day.